Immaculately presented and restored 4 bedroom character property in the heart of the popular Yorkshire Dales village of Ingleton. A stylish and comfortable home or the perfect holiday retreat, Dale Bank Cottage has terraced gardens, a garage, off-road parking and enjoys views across the valley. Available to market with no chain. No expense has been spared in the renovation of this stunning period semi-detached cottage. The property has been fully rewired and has new gas central heating. The original sash windows have been restored and period features retained throughout. With a new kitchen, bathroom and en-suite, the property is ready to move into and enjoy. On the ground floor the newly constructed entrance porch provides access to the kitchen/diner, with feature stone fireplace and log burner. The hall has a stunning period stained glass window, with stairs rising to the first floor and a door to the living room. The comfortable living room has a feature fireplace and French doors to the terraced gardens. On the first floor, there are 2 double bedrooms and the modern bathroom. Stairs rise from the landing to the second floor which has a master bedroom with new en-suite and new sash dormer window providing spectacular views. 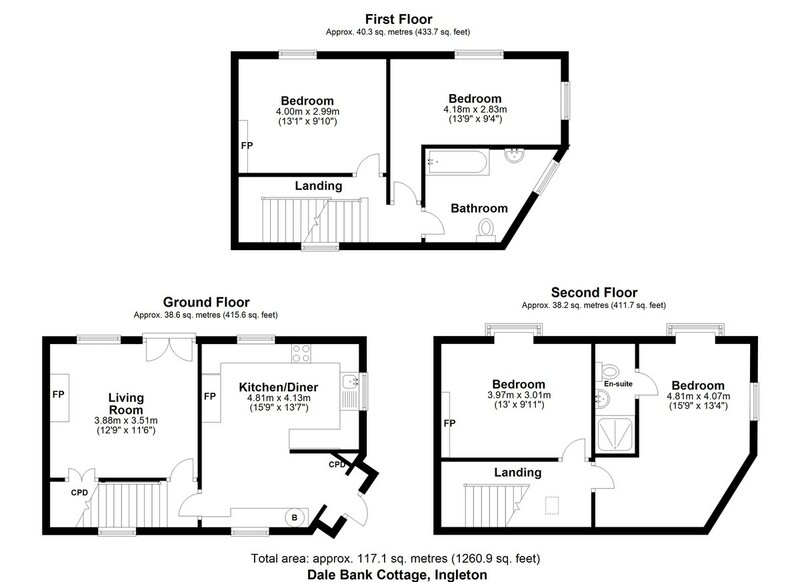 The 4th bedroom is also a double, has a feature fireplace and sash dormer window from which to enjoy those views. Ingleton is a popular village - a gateway to the spectacular Yorkshire Dales National Park. With bars, pubs and shops, it is well known for its stunning waterfalls walk. Ingleton has a primary school and is in the catchment area for highly regarded secondary school education at QES, Kirkby Lonsdale and Settle College. As well as the Dales, the Forest of Bowland AONB is close at hand and the Lake District can be reached within under an hour. Trains can be caught at Bentham. Lancaster and the M6 are half an hour by car. The popular market towns of Settle and Kirkby Lonsdale are a short drive away and both have Booths supermarkets. Dale Bank Cottage is on mains drainage, water, electricity and has gas central heating. Ethernet points have been fitted in all rooms and there are integral smoke and carbon monoxide alarms. Works are currently underway to extend and improve the parking area. PORCH Newly constructed entrance porch with slate roof. Timber front door. Space to hang coats. Open doorway to kitchen/diner. KITCHEN/DINER 15' 9" x 13' 6" (4.81m x 4.13m) Max. Welcoming kitchen/diner with sash windows to the front, side and rear aspects. Modern fitted kitchen with range of wall and base mounted units. Butler sink. Integral appliances include, oven, hob with extractor, washing machine, fridge and freezer. Feature stone fireplace with log burner. Built-in cupboard housing the gas central heating boiler. Oak veneer flooring. Radiator. Door to hall. HALL Hall with newly carpeted stairs rising to the first floor. Stunning original stained glass window. Door to living room. LIVING ROOM 12' 8" x 11' 6" (3.88m x 3.51m) Comfortable living room with sash window and new French doors to the front aspect. Feature fireplace with open fire. Built-in cupboard. Oak veneer flooring. Radiator. LANDING Landing providing access to all accommodation on this level. Natural light from the feature stained glass window. Oak veneer flooring. BEDROOM 13' 1" x 9' 9" (4.00m x 2.99m) Charming double bedroom with sash window to the front aspect. Feature period fireplace. Oak veneer flooring. Radiator. BEDROOM 13' 8" x 9' 3" (4.18m x 2.83m) Another double bedroom, currently used as an office. Sash windows to the front and side aspects. Oak veneer flooring. Radiator. BATHROOM Stylish modern bathroom with sash window to the side aspect. Bath with shower over. WC. Wash hand basin. Oak veneer flooring. Heated towel rail. LANDING Roof-light window. Oak veneer flooring. Doors to both bedrooms on this level. 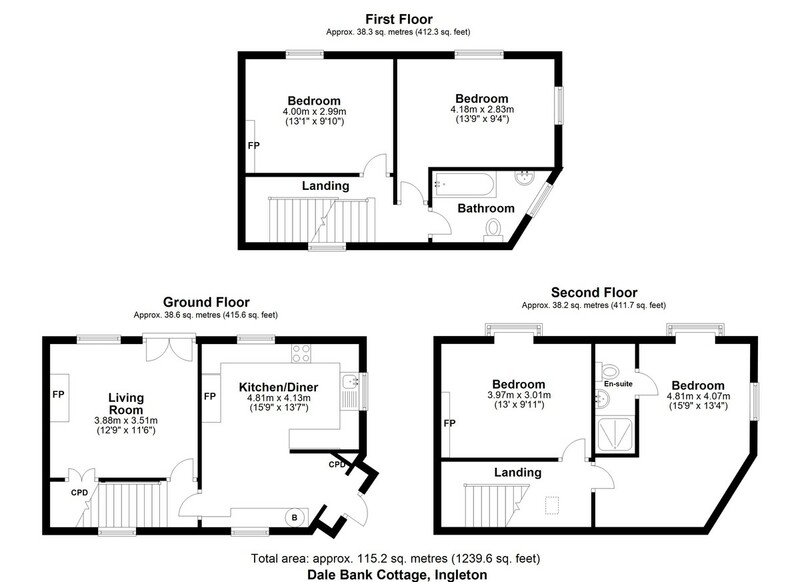 BEDROOM 13' 0" x 9' 10" (3.97m x 3.01m) Double bedroom with sash dormer window providing views to the front aspect. Feature period fireplace. Oak veneer flooring. Radiator. BEDROOM 15' 9" x 13' 4" (4.81m x 4.07m) Master bedroom with new sash dormer window providing front aspect views and sash window to the side aspect. Under eaves storage area. Oak veneer flooring. Radiator. Door to en-suite. EN-SUITE Master bedroom en-suite with shower, WC and wash hand basin. Extractor fan. Oak veneer flooring. OUTSIDE Dale Bank Cottage is approached by a lane from The Square. A pedestrian walkway also leads up to The Square and a further path leads down to the riverside area with picnic tables and open air swimming pool.